Our school community works together to create a robust learning culture which continues to improve and strengthen the school in line with our Catholic ethos. The word ‘ethos’ comes from a Greek word for custom or habit. The ethos of the school can be defined as: 'a way of living, behaving and doing things by people, who though diverse, follow common values and are linked by a shared vision of life.' - Monsignor Marcus Stock, Christ at the Centre, Catholic Truth Society, 2012. The mission of our school is based on the belief that every child is a unique person created in the image and likeness of God, with a God-given potential for growth and an eternal destiny in heaven. All adults within the Oratory school community have a special vocation to ensure that our children receive the very best educational experience in order to grow in love and knowledge of God, their neighbour, themselves and the created world. Anything less is not an option. The school’s Mission Statement, ‘Shining as to be a light to others’ for Jesus! This is lived each and every day by adults and children. We all work hard to ensure that everyone, Catholic and non-Catholic alike, is valued and treated with respect. Our children from a young age reflect upon ‘My Vocation’ by Blessed John Henry Newman. They begin to understand they have a mission; that they are a link in a chain, a bond of connections between persons. Year 6 receive a Rosary at the end of their time with us as a visible and concrete reminder that they are forever linked with our school. Building the Kingdom – we are currently reviewing and improving our Curriculum. Father Anton and Brother David come to school on a weekly basis to support our children in Sacramental preparation, praying the Rosary and catechism. On Tuesday’s Father Anton and Brother David teach Sacred Music to children in Years 1 to 6 in preparation for singing the Mass responses in Latin. The Oratory Mission Team (Year 6 children) contribute in a planned and systematic way to the school’s evaluation of its Catholic Life and mission of the school whilst taking a lead in planning and evaluating improvements. Oratory Guardian Angels help our new children in Nursery and Reception settle into our school during their first year. We support a variety of charities throughout the year including ones that have been decided by our children due to personal experiences, for example: Diabetes UK, St Mary’s Hospice and Macmillan Cancer Support. Monday - Weekly Gospel is discussed and reflected upon. This is led by the Head Teacher using Ten:Ten Resources. The main theme/s from the weekly Gospel is disseminated through Collective worship in class which is led by the Class Teacher or the children. Tuesday – Class Teacher’s use Ten:Ten Daily Classroom prayers and reflections. Wednesday – Children initiate, plan and lead Collective Worship in class. 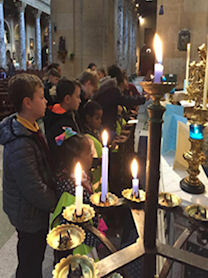 Thursday – Children reflect upon previous day’s Collective Worship and consider, as a class, what went well and improvements that can be implemented the following week. 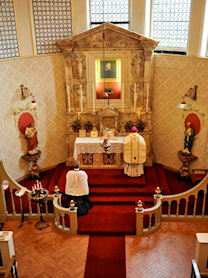 Friday – Class Mass at the Shrine of Blessed John Henry Newman or whole school Mass at school or the Oratory Church.